So the Husband is English (yes the accent is fantastic and yes it is the reason I agreed to go out with him in the first place and then sat and was memorized by his voice... ok I am drifting from the point). One of his biggest complaints here is that he just can't seem to get a home-cooked meal that would be normal for him. I understand this after melting down in Tesco's on our trip to Europe - I think it was day 5 or 6 and we went to the store to get some food to make supper and I was dazed, confused and lost NOTHING seemed familiar or normal. I have been trying my best to learn things that he would have at home in England and make them. Sometimes I run into problems like not being able to find proper english style sausages (yes it is on my list of things to cook/make for the 366 challenged). 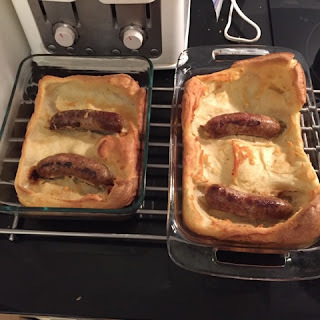 Last night I made Toad in the Hole (a variation on Yorkshire pudding). 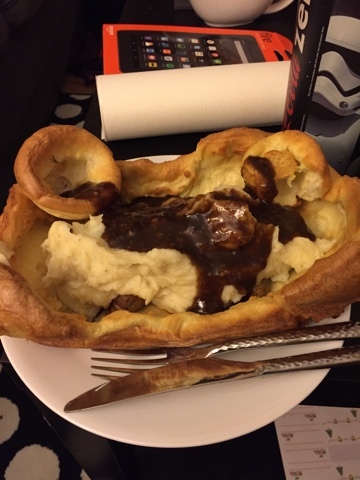 Basically it is bangers cooked into the yorkshire pudding, then served with mashed potatoes, veggies (normally - but don't get me started on the microwave..), and a red win reduction gravy (yum!). I have had people say that they are afraid of making Yorkshire pudding but honestly it isn't that tough. I measure my dry ingredients with a scale. (for a variation the small ones in the pictures had rosemary added, and next time I might try some different spice combinations to see how they go). Using a metal whisk beat the eggs until they are smooth and creamy yellow colour. Add the flour and whisk until the mixture is smooth. Do not be afraid to beat the mixture hard you want to incorporate air into the mixture. Once smooth whisk in the milk. I use a 4-cup glass measuring cup for this entire process. Once the mixture is fully combined I cover it with plastic wrap and put it into the fridge (leave the whisk with the batter). This can be done right before you make them or in advance - I try to do it in advance or at least make the batter before I start heating the oven. Heat the oven to 350F. Once the oven is preheated I then put oil into my containers. I use either muffin tins (for the small ones) or glass cake pans (prefer metal) 9"x9" for the large ones. Put the pans/tins into the oven until the oil is HOT (at least 5 minutes) but pull if the oil starts to smoke. Grab the batter from the fridge and whisk again then working as close to the oven as you can pour the batter into the tins/pan - I would guess until the space is about half full on muffin tins about 1" tall in the cake pans. Cook in the oven for 25-30 minutes or until golden brown. Try to not open the oven door because the steam will escape. - This variant is basically done with cooking the sausages until they are no longer pink, then place into the oil and then cover with the batter as above. I had a problem with the sausages not being cooked into the dough itself - I didn't use enough of the batter apparently but still very tasty. I used the oil/fat from the sausages and cooked that with red wine until it reduced before adding some broth, salt and pepper and some flour to make a gravy.